Hey all! 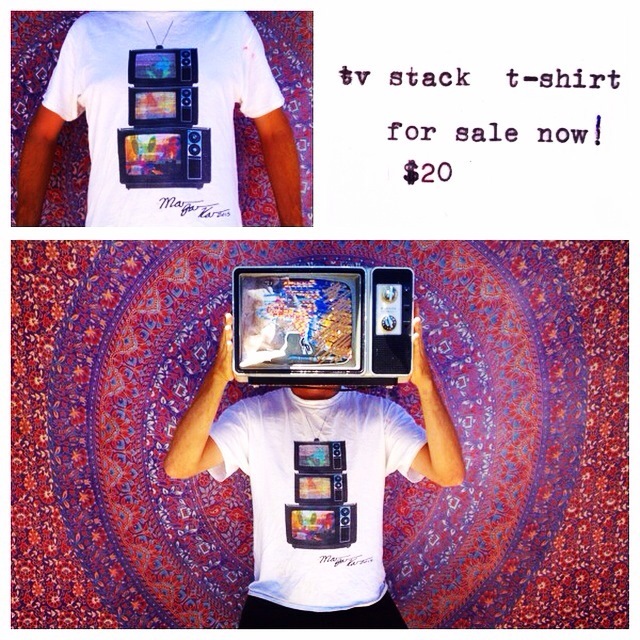 So it’s been about a month since I’ve been on tour and I still have more than a few of these TV Stack T-Shirts left. I’m a little bit of a TV head (as you all know), and I think this design adequately portrays the Ma Ja Ka icon in a single burst of brilliance. Personally signed by the dream laborer himself, each TV is turned to a different station of this zen lunatic mind, with Ma Ja Ka playing on a south Philly rooftop, the Big Sur sunset that inspired a thousand poems, and the poet reciting from within his own pop up Dream Oven all a part of the programming. It’s pop art and it’s post modern. It’s poetry and it’s magic. And I’d love for you to share all the buzz. To get your very own T-Shirt, please PayPal $20 to marshall.kavanaugh@gmail.com with your size and an address for me to send it to. $20 covers shipping and handling, the cost of production, and helps make sure a starving poet can live to write another day. I might just include a personalized typewritten haiku as a way of saying thank you. Adult Sizes in S, M, L, and XL are all still available while supplies last. Thanks!